I’ll admit being a little late to the party on this film, which has popped up on a surprising number of critics’ “10 best” lists for 2018. I say “surprising” because it has had limited theatrical engagements since late November and has only been streaming on Netflix since December 14th (I stumbled across it quite by accident while scrolling through the network’s maddeningly unsearchable programming menu) It has also been nominated for 3 Golden Globes: Best Foreign Language Film, Best Director, and Best Screenplay (as I have already discussed, I have to raise a Belushi eyebrow regarding that screenplay nom). 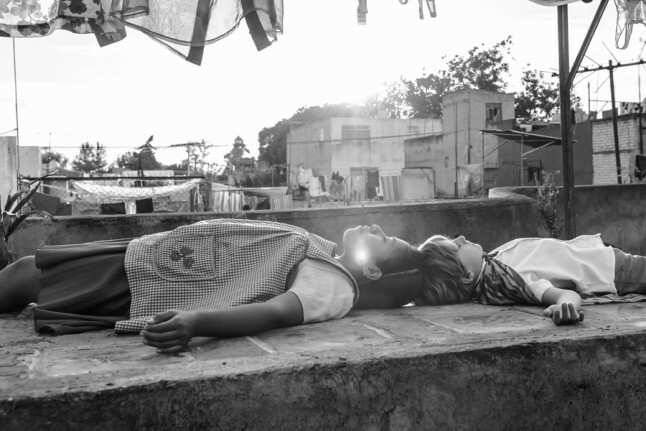 While many of my fellow critics have swooned mightily under its apparent spell, for me Roma is, alas, a mixed bag. Aparicio has a quietly charismatic screen presence and gives a fine, naturalistic performance as Cleo; although you wish she’d been given a little more to do with her substantial screen time beyond playing the quietly suffering, archetypal Noble Peasant. Visually, it’s quite a beautiful film. And there is certainly nothing wrong with emulating and evoking the likes of Fellini, Kalatozov, Bertolucci, Antonioni, and other masters of world cinema. It’s just a bit of a disappointment from Curaon, who has given us some outstanding films like Y Tu Mama Tambien, Children of Men, and Gravity. (The 2019 Golden Globes ceremony airs this Sunday on NBC @8pm EST/5pm PST).